​William Jermy Jephson was born on July 5, 1886 in Winnipeg, Manitoba to parents John and Christian Jephson. The Jephson’s had four children, William, Helen, Arthur and John. By 1901, the Jephson family had moved to Calgary which was then a part of the N.W.T. As a young man, William would follow in his father’s footsteps, attending law school and becoming a barrister. 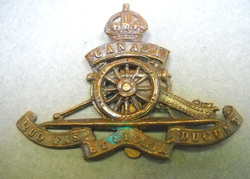 On April 3, 1916, William Jephson enlisted with the 61st Battery 15th Brigade Canadian Field Artillery and was appointed Brigade Sergeant Major. BSM Jephson arrived in England on September 22, 1916 aboard the SS Cameronia. He would serve with the CFA in England until April 25, 1918, where he was discharged from Canadian service and given a commission with the 175th Brigade Royal Field Artillery. Second Lieutenant Jephson would serve with this British unit in France and Flanders for five months. 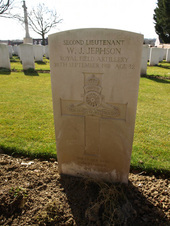 On September 26, 1918, Second Lieutenant Jephson was killed in action. He was laid to rest at Athies Communal Cemetery Extension. William Jephson was awarded the British War Medal and Victory Medal. His mother, Christian received the Memorial Cross and death plaque in honour of her son.